Is your fax machine secure? In today’s business world, faxing is still a big part of how businesses communicate with each other and with their customers. Fax machines are older technology, and that means the security for faxes are older to. This means that while people view fax as a safe means of communication, they actually are very prone to attack. All it takes is a hacker to send a malicious fax to the fax machine, and then the hacker will have access to the network that the fax machine is on. So what is the solution? There are multiple solutions for this issue. One way to fix it would be having your fax machine on a different network. So if a malicious fax is sent to the fax machine, then it would not have access to anything because the fax is isolated away from employee or personal computers. 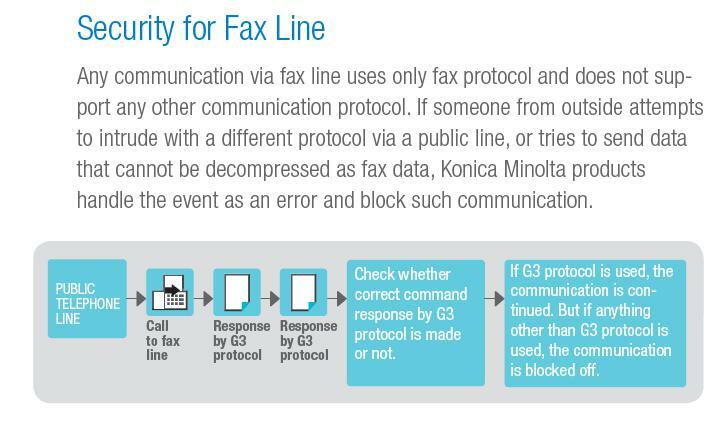 Additionally, Konica Minolta machines will block off any communication that is not a G3 protocol. Can my fax machine be hacked into? What steps can I take to prevent this? It is always a good idea to make sure your business’ and client’s information are safe. If you have any other questions, then give us a call and see how PDP can help you.